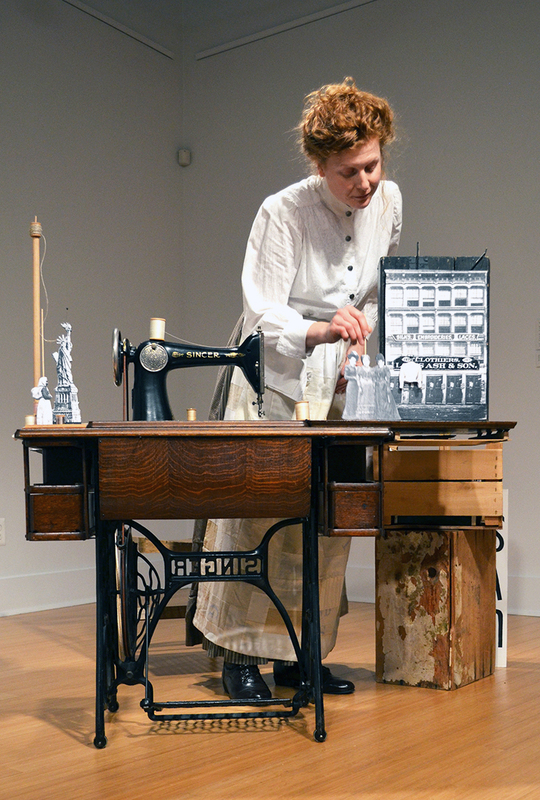 “The Garment Worker’s Tale” follows the journey of a young immigrant who leaves her home country to seek her fortune in America. 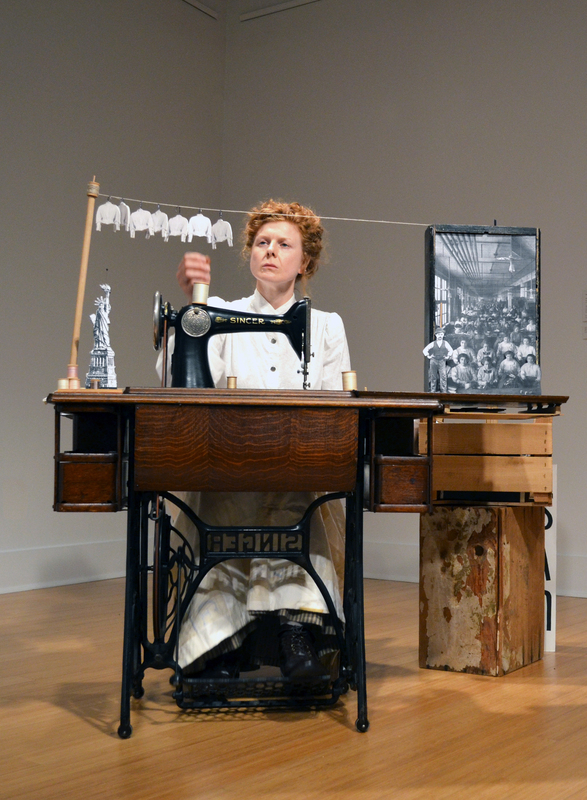 The story is inspired by historic accounts of garment workers at the end of the 19th century in Baltimore and New York City, and by events like the Triangle Shirt Waist Factory Fire. 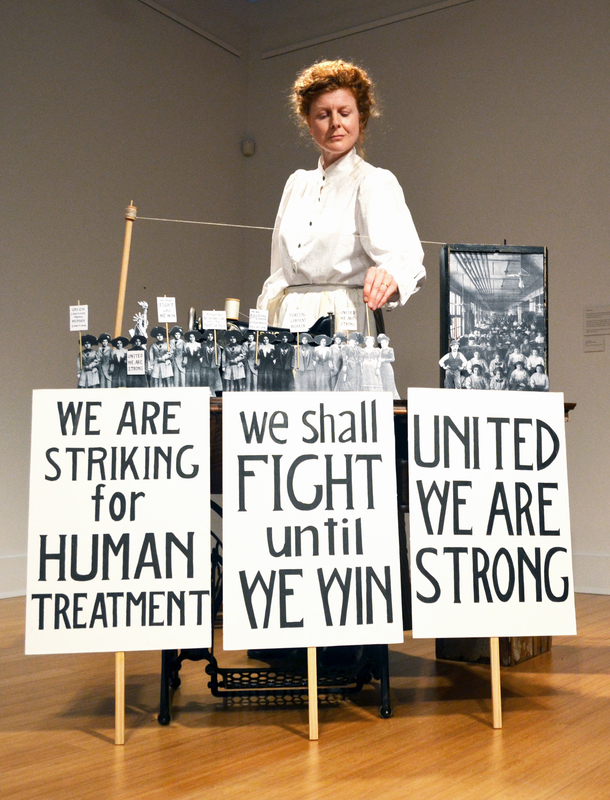 The puppets are based on archival photos of immigrants and garment workers of the time, and the buildings and on historic street scenes of Baltimore. There is no dialogue or spoken narrative. 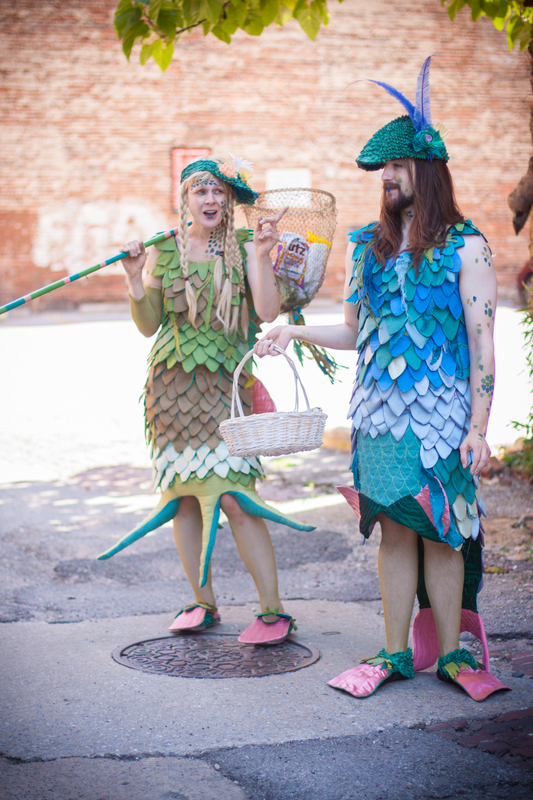 Charm City Merfolk is a walkabout performance featuring two costumed characters. These ‘merfolk’ are centuries-long residents of the Chesapeake Bay who have left their native waters in order to understand the source of its destruction. In search of answers and possible solutions, they wander the streets of Baltimore, interviewing its residents, intercepting debris before it enters the waterways and crafting merfolk charms from plastic bottles. Additional performance by Jacob Dillow and photos by Ana Tantaros. Professor Bluegill is a walkabout performance inspired by my concern about the impacts of pollution on the Chespeake Bay. In the performance, the Professor reads a cautionary tale to his students, a class of fish housed in the school on the back of his bike. “The Tale of Tip & Flo” follows two fish, on their search for food in the Harbor waters. The tale addresses the issue of pollution in the Bay and concludes with Tip and Flo taking action to bring life back to the Bay. Riparia is an ongoing performance project motivated by my interest in storytelling as a potent and ancient form of popular edutainment. Specifically, I am interested in how storytelling and interactive performance generate curiosity and exchange between performer and audience, and allow participants to learn more about the place they inhabit. 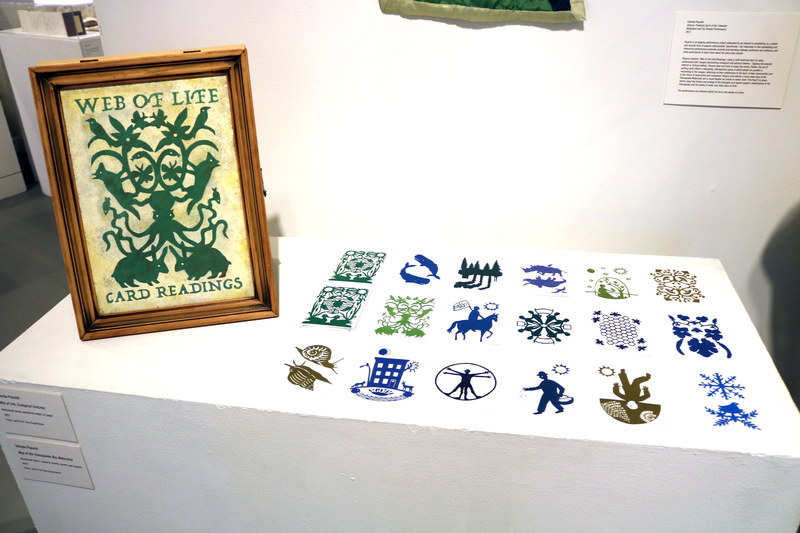 Riparia conducts ‘Web of Life Card Readings’ using a (still-evolving) deck of cards, emblazoned with images representing ecological and political themes. Tapping into popular interest in ‘fortune-telling’, Riparia does not claim to augur the future. Rather, the act of pulling cards effects a temporary, introspective space in which people are guided in responding to the images, reflecting on their relationship to the land, to their communities and to the forces of destruction and restoration. 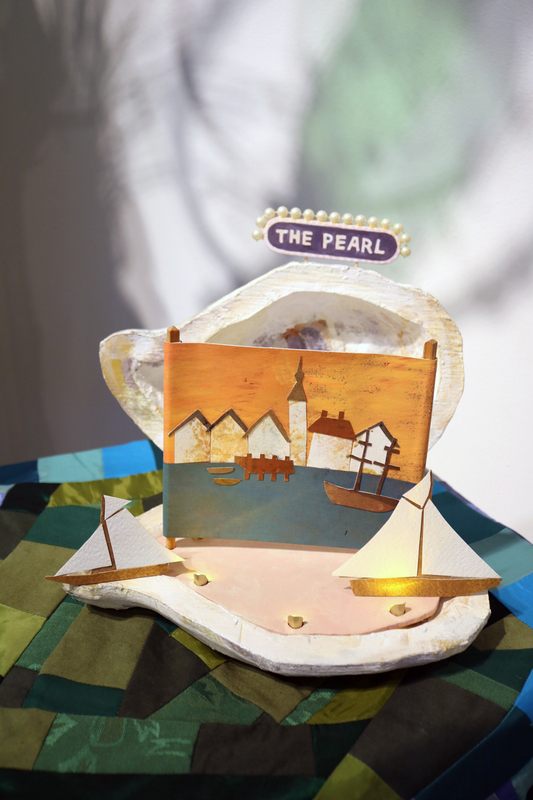 Riparia also utilizes a hand-sewn map of the Chesapeake Watershed and a small theater set inside an oyster shell (‘The Pearl’) to share stories about the history and ecology of this bioregion and explore people’s relationships to the Chesapeake and the bodies of water near their place of birth. The performances are intimate events for one or two people at a time. Riparia is an ongoing performance project motivated by my interest in storytelling as a potent and ancient form of popular edutainment. Specifically, I am interested in how storytelling and interactive performance generate curiosity and exchange between performer and audience, and allow participants to learn more about the place they inhabit. 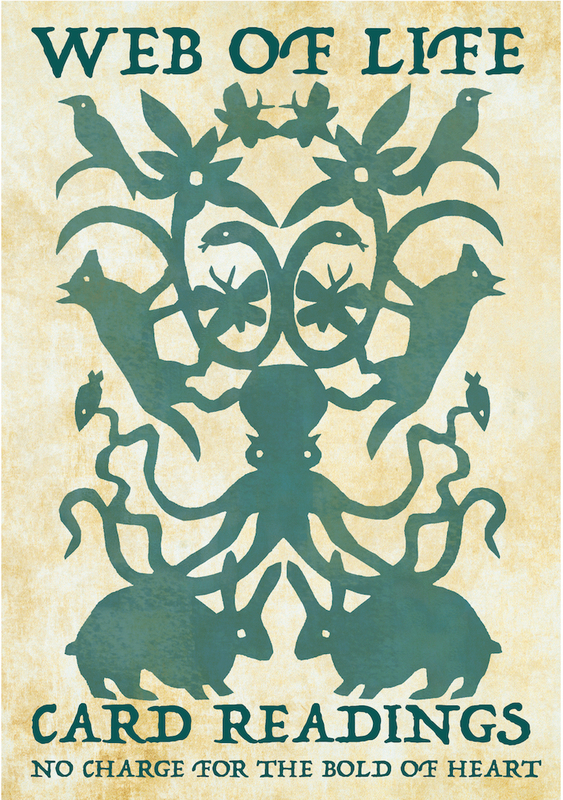 Riparia conducts ‘Web of Life Card Readings’ using a (still-evolving) deck of cards, emblazoned with images representing ecological and political themes. Tapping into popular interest in ‘fortune-telling’, Riparia does not claim to augur the future. 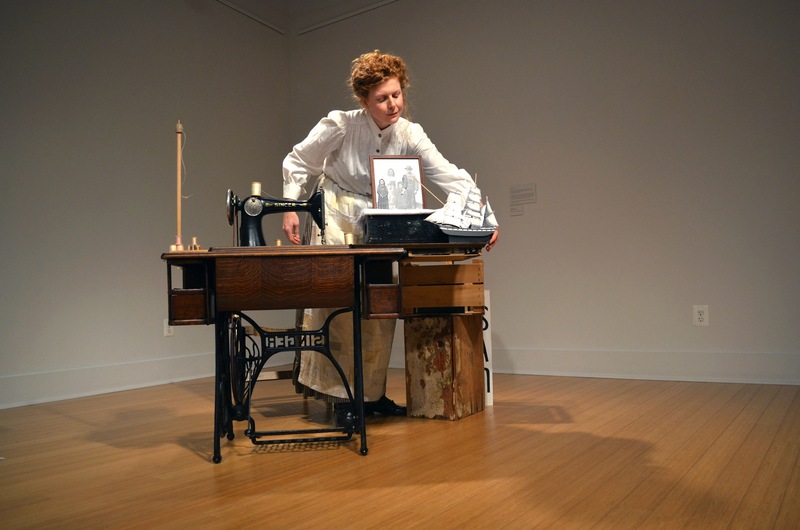 Gallery exhibition of the costume and performance objects from Riparia at the MICA Decker Gallery, September 2017. 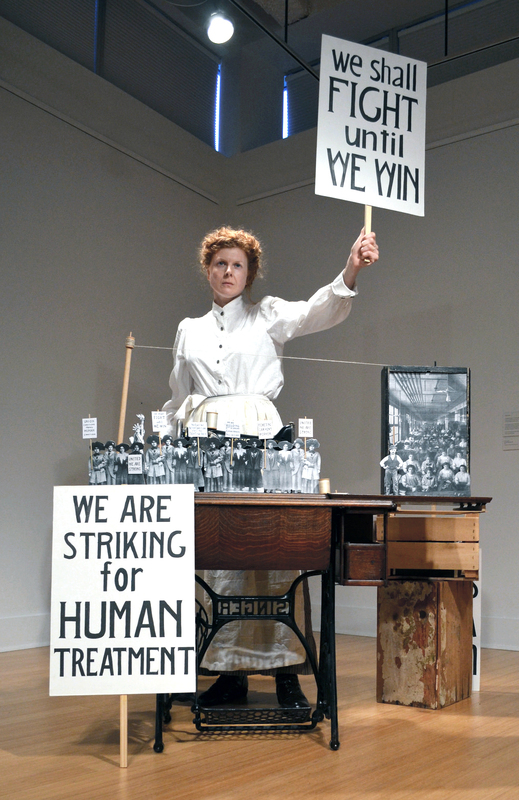 The Pearl Theater on view at an exhibition of the Riparia costume and performance objects at the Decker Gallery, MICA, September 2017. Riparia is an ongoing performance project motivated by my interest in storytelling as a potent and ancient form of popular edutainment. 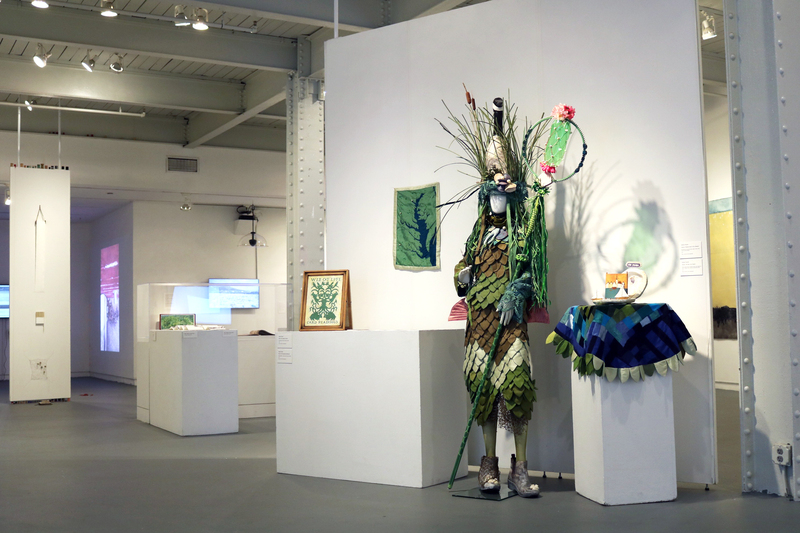 Web of Life Cards / Ecological Fortunes on view alongside the Riparia costume and performance objects at the Decker Gallery, MICA, 2017. 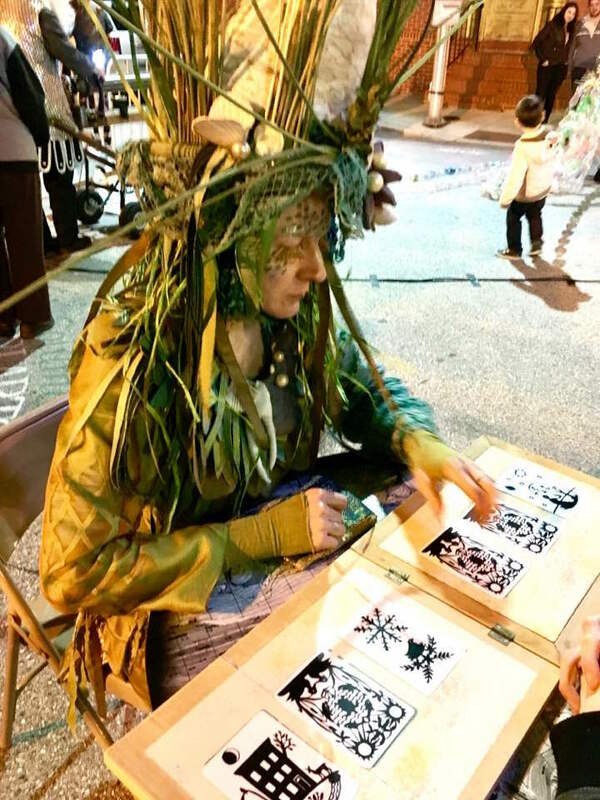 Riparia reading the Web of Life cards at the Fountain of Extinction Climate Procession organized by Laure Drogoul, Light City 2017. Professor Bluegill is a walkabout performance inspired by my concern about the impacts of pollution on the Chespeake Bay. 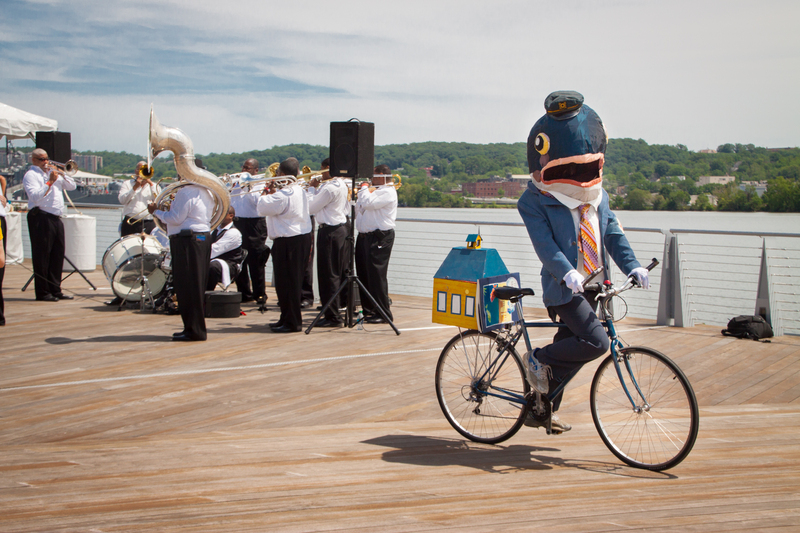 In the performance, the Professor reads a cautionary tale to his students, a class of fish housed in the school on the back of his bike. “The Tale of Tip & Flo” follows two fish, on their search for food in the Harbor waters. The tale addresses the issue of pollution in the Bay and concludes with Tip and Flo taking action to bring life back to the Bay. 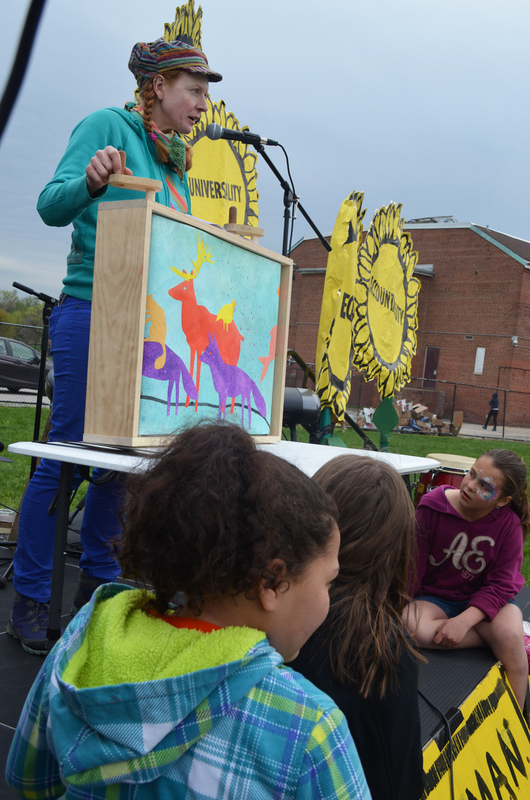 The show has been performed at various performance festivals including the 9th International Toy Theater Festival in New York City, the 7th Annual Transmodern Festival in Baltimore and the Puppet Company in Glen Echo, MD.